Andrea uses a student’s early Task 2 writing and highlights the “typical mistakes” made by the student. Working with the student on the mistakes allowed her to ultimately gain the band score she needed. You’ll see how she improves in later IELTS Test Prepcasts. Pretty has allowed us to use some of her task one and two writings to show how she has improved her basic grammatical accuracy in a few weeks, by using the list of typical student errors (See Episode 15) which has allowed her to reach the band scores she needs by learning to recognise that she is making these errors and now correcting them when she does. As you read Pretty’s answer hover your mouse/cursor over the underlined text to understand the typical error used. In this competitive world, Both parents are working, While some people think that children can take more advantages with additional money, others think that lack of parents support lead to wrong way? In today’s contemporary world, both parents need to consider for work. Some people argue that extra income provide additional support to the children to fulfil their needs. While others are contend that lack of parents’ support make them negligent. Some people who favouring both parents need to work that children can get more advantageous things by fulfilling luxuries need such as mobile phones, laptops, outdoor trips etc. Through this children will have more access of technology. Therefore which will help to gain more information regarding studies, which is the best way to divert children’s mind. On the other hand, there are those who claimed that without parents support children will show negligency regarding their studies such as home work, exam revision and also will not get nutrient rich food to make their immune system stronger. Moreover absence of parents can lead to the children towards wrong crowd such as drugs and undertake drinking. As nowadays youngsters are more addictive for poisonous things. According to my opinion, parents are always a first key worker for their children. They can observe their children’s habit as quickly, as anyone else cannot do that. So, parents should spend time with their children after work. Moreover they can make a daily schedule for their studies and playing games, eating etc. Like this children will learn the time management skill in later life. In conclusion, I believe that we cannot change the fact that both parents have to work nowadays. But parents should spend evening time with the children or they can arrange weekends out or foreign holidays which will be beneficial for children to know about different cultures. 11. Some people say that if both parents work, their children can have luxuries they would not otherwise be able to afford, such as mobile phones, laptops or trips with the school. 3. the absence of parents can 11. make the children fall in with a bad crowd, (8 part 2) as they have no guidance and start taking drugs or drinking too much. This writing example shows how easy it is to lose at least one band by making all these basic errors. It is also helpful to keep a list of typical errors near you when you are writing or preparing speaking , so that you can soon begin to correct your errors by yourself and not make them in the actual exam. Steve: Hello. 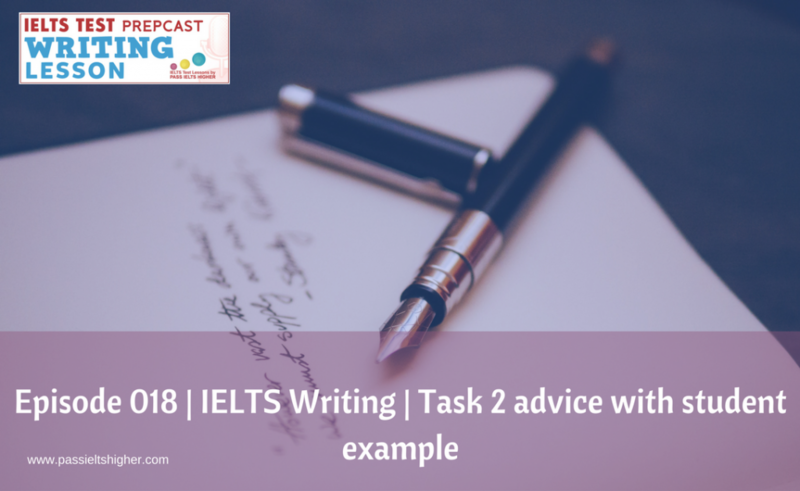 Today we’re going to be talking about IELTS writing, and in particular, we’re going to be talking about task 2. We did introduce this during our last lesson, and we did explain that we were going to start looking at some student task 2 writing. And Andrea’s going to provide some comment on it. I have with me today Andrea, and it’s been a while since we spoke, but how have things been going in the interim? Andrea: Yes. Everything’s fine, bit, bit cold, lots of hard work. What about you? Steve: I’ve been quite busy. I’ve been able to travel, been over into Europe, where it’s been a bit brighter. I’m back now. The weather is, as you say, has turned a bit, it’s a little bit chilly, but generally, I’m fine. Steve: Right. So let’s carry on. What are we going to be doing in detail today? Andrea: We recently recorded a podcast which was a list of typical student errors, and if the students have these in their writing, they’re never going to get their band 7. And for that reason, I’ve made a list and I point them out when students do writing for me. That was podcast number 15. Andrea: And it’s called a list of typical student errors. I’ve got an example from one of my students called Pretty. This is the first example we’re using. Pretty has kindly allowed us to use some of her task 1 and task 2 writings that she did for me. And as we see, her writing example, by example, you’ll see how Pretty’s basic grammatical accuracy has improved in a few weeks just by looking at this list of typical student errors. She has—thank goodness, and for her especially—finally reached a band score of 7 she needs by learning to recognize when she makes those errors so that she corrects them spontaneously. And that means that she’s been handing in her writing for her exams with not such serious typical student errors in the writing. Steve: Have you been able to speak to Pretty? So clearly, you were giving her a bit of guidance as to how to avoid them, you know, a bit like the guidance that you were giving to our students back in episode 15. Have you been able to speak to her, to understand perhaps how difficult she found it to implement? Andrea: I think. I would just say, in general, not about Pretty especially, that students just forget. You can tell them and tell them “Do this” and “Do that” and they do forget. It’s probably better if there’s a teacher there or somebody to help them and say, “Look. What’s this?” And you don’t tell them what it is. You point it out and allow them to think about it and they visit it. Then hopefully, afterwards, they can go away and take that knowledge and look at their own writing and then suddenly realize, “Oh, I’ve forgotten the ‘s’ on the ‘it’ verb” or something like that. Very typical mistake, of course, is forgetting the “the” or the—sometimes, when we put ‘a’ and sometimes they put “the” when we shouldn’t have anything at all. So that’s a very typical mistake, but that, the students really have to think about that to start getting it right. Andrea: But it is worth it, of course, because eventually, they will get their band 7s when they don’t have these basic errors. Steve: Okay. So like with most things in life, the more you practice, the better you’ll get. Andrea: Yes. And I always say that. Go away and practise. Whatever you learn, whatever you learn from these podcasts, whatever you learn while you’re studying, you must go away and practise because it won’t stay in your head otherwise, really, and also then you won’t be able to recycle it. Andrea: The question that Pretty answered this time was this one: “In this competitive world, both parents need to work. While some people think that families gain more from having more money to spend, others think that no parents at home to care for the children can cause the children to behave badly. Do you agree with this question?” Pretty’s answer is as follows, but I’m going to interrupt her answer where she’s made mistakes, and hopefully, they’re not concentrating our listeners on the sort of mistakes that they might be making and how to correct them or why they need to correct them, really. Steve: Okay. And just for the benefit of the listeners, we will be placing the entire text, including your comments, onto the website, on the page wherein which this lesson, episode 18, appears on the website. Andrea: Yes, good. That’ll be much easier for them. Andrea: So Pretty wrote, “In today’s contemporary world, both parents need to consider for work”. As you can hear, there is a mistake there, and the mistake is the wrong preposition, which is number 4 on our list of typical student errors. So Pretty said “need to consider for work”, but in fact, we don’t say “for work”. We probably would say “consider working”, so that you know after the verb “consider”, the next word is an “ing” form word or a gerund. “Some people argue that extra income provide additional support to the children to fulfil their needs”. As you can hear, Pretty forgot the “s” from “provide” when we were talking about “extra income”. “Extra income” is an “it”. It’s singular, or third person singular, so the verb that goes with it needs an “s”. I’ll read it again. “Some people argue that extra income”. This is mistake 7. The noun is singular. “Income” is singular, so the verb, “provide”, should have an “s” on. “Provides additional support to the children to fulfil their needs. While others contend that lack of parent support make them negligent.” So there are a few mistakes here. “While others are contend that—if you, this is basic error number 1. You are referring to something in particular, and that something in particular is “lack of”, and so you have to say “the lack of”. It needs the definite article. And “lack” is a singular noun. It’s an “it”, so the verb then needs an “s”. So “the lack of parent support makes them negligent”. And that’s again, that’s mistake number 7. The verb is singular. “Some people who favouring”. Pretty’s native language has an influence on her English. She comes from India, and Indian language likes to use what we call the present continuous instead of the present simple. So the present continuous is the “ing” form. So Pretty’s put “some people who favouring” when in fact, when you talk in general, which is mistake number 5 on the list of typical students errors, you need the present simple tense. So she should’ve put “some people who favour”. And then she said “both parents need to work that children can get more advantageous things by fulfilling luxuries”. This is mistake number 11, typical mistake number 11, when the word order is all wrong. So if you get the word order wrong, you just need to rewrite it, so that you need to practice rewriting it or allow your teacher to correct it for you and just learn the correction, really. And what I would say here, “Some people who favour the need for both parents to work so that children can get more advantageous things by fulfilling their luxury needs such as mobile phones, laptops, outdoor trips, etc. Through this, children will have more access”. This is mistake number 4, where the wrong preposition has been used. “Through this, children will have more access of technology.” Of course, we say “more access to technology”. So remember always, when you’re learning your verbs or your phrases, remember the prepositions that go with them. That’s quite a serious omission and loses you lots of marks. “Therefore, which will help to gain more information regarding studies, which is the best way to divert children’s mind.” This is a collocation, and because there is more than one child, it’s plural. “Minds” also has to be the plural noun. This is mistake number 7 on the list. And again, I’ll read it. “Therefore, this will help to gain more information regarding studies, which is the best way to divert children’s minds. On the other hand, there are those who claimed”—and here, Pretty’s put the tense in the simple past, which means that it’s finished. In fact, when you’re talking in general in task 2, you should be using the present simple tense. So Pretty should have said “On the other hand, there are those who claimed”—and “those who claimed” is a nice expression, but unfortunately, Pretty made it a past tense. “There are those who claimed that without parent support, children will show negligency.” Pretty’s forgotten what the word should be, really, so this is number 11, wrong word or word order. “And the children will show negligence”, which is spelt “n”, “e”, “g”, “l”, “i”, “g”, “e”, “n”, “c”, “e”. “Regarding their studies, such as homework, exam revision, and will not get nutrient-rich food to make their immune system stronger.” Moreover, if you’re going to refer to something specific, you need the definite article, which is “the”. Pretty forgot it. That’s, again, that’s very typical influence from her own language, as they use articles in a different way. “Moreover, the absence of parents.” So there should’ve been a different article there, which is error number 3 on the list. “The absence of parents can lead to the children towards wrong crowd.” This is error number 4, where Pretty’s used the wrong preposition. We don’t say “lead to”. In fact, you don’t need a preposition here, so “the absence of parents can lead the children towards wrong crowd such and drugs and undertake drinking. So her whole word order is wrong there, and that’s mistake number 11. And my correction will be “It makes the children friends with the wrong crowd”, maybe. “Wrong crowd” is a nice collocation. “And that wrong crowd takes drugs and drinks too much.” “So nowadays, youngsters are more addictive for poisonous things”. So Pretty’s put the wrong preposition, which is mistake number 4, and the expression should be “they’re more addicted to”. And I’ve allowed “poisonous things”. So “they’re more addicted to, maybe, things which are toxic for their blood” or something like that. “According to 11”—this is a wrong word. We don’t really say “according to my opinion”. We say, the collocation is “in my opinion”. “Parents are always a first key worker for their children.” Pretty’s put “a first key worker”, but in fact, we’re being specific, so this is mistake number 3. When you refer to something specific, you need “the”, so “the parents are the first key workers”. “As quickly as anyone else”, that’s word order, mistake number 11. And the correct sentence is “They can observe their children’s habits more quickly than anyone else”. “So parents should spend time with their children after work. Moreover, they could make a daily schedule for their studies, and playing games or eating, etc. Like this, children will learn time-management skill.” Pretty’s forgotten the “the”. “People will learn”—Pretty’s put in a “the” that you don’t need. When you’re speaking in general, you don’t need an article. This is mistake number 1. “Children will learn time-management skills”—which is a nice collocation as well, and—“in later life.”And the last one, in the conclusion. She’s put “which will be beneficial for children to know about different cultures”. That’s the wrong word order and wrong words, really, so mistake number 11. The correction is “which will help children to learn about different cultures”. So in conclusion about this, I say that example 1 shows how easily it is to lose at least one band by making all these basic errors. So the actual writing, probably the format, could be quite good, but there are so many errors, she’s lost at least one band, probably 2. She might even only get a 5, maybe less. Steve: I see. So just to reassure the students who are listening to this, this is a not particularly good example of the written English. And we did that on purpose because we wanted to take if like an immature piece of writing and critique it to highlight the errors. Now the student, as you’d mentioned earlier, did improve by taking the advice that you had given, which we have also produced in episode 15. So what we’ve done here is we’ve repeated her writing, with her permission. We’ve repeated her writing verbatim, and we’ve included the corrections that, or rather the identification of the errors that you’ve identified. And at the bottom of the text—and the people who go to the website will see this—at the bottom of the text, what we’ve actually done is we’ve included the corrections and the reason for each of the errors that you’ve identified. Andrea: Yes, exactly. And then what I always recommend my own students is to keep a list of those errors by you when you’re writing so that, at the end, you can double-check. And you can see what, have you made any of these mistakes? And if you have, you can put them right. And the more you do this, as we are always saying, the better you’re going to get, and eventually, you will get the band that you want. And hopefully, you’re not going to make these errors in the exam if you practise before you go in, if you practise with your writing before you go in. Steve: Okay. So yes, I guess, we say again that this is a difficult lesson. They do need to concentrate on the writing, they do need to listen to the advice you’re giving, and they do need to go and read it as well. That will help it sink in. Andrea: Yes, that will stay on their minds. Steve: But frankly, if the writing is of this sort of standard, they’re looking at about a band score 5. Steve: Possibly. If they want to improve, they do need a band score 7 for university places or college places or even higher. If they want to get into Australia, then they’re going to need to be taking account of some of these errors. Andrea: Yes, for sure. They’ll never get a 7 if they make any of these errors, because they’re very basic. And by band 7, you shouldn’t be making that sort of mistake. Steve: Right. Okay, so in terms of what we were trying to achieve today, I think we’ve obviously given people a lot to think about, a lot to go away and work on, which I think is good. So we’ve achieved what we set out to do today. Just to tease our listeners for future episodes of the podcast, what we’re going to start doing now is releasing very, very short podcasts where Andrea answers questions which have been sent to us by the students listening to this podcast. And what we’re aiming to do is to do roughly one of these per week. And they’ll be very short, so the format of them will be student asks this question and here’s Andrea’s response. If these prove popular, what we’re going to do is place a recorder on the website, where people who are listening to the podcast can actually just click on the recorder, leave a question, and their voice will actually appear in the podcast as well. So hopefully, that will be of interest to some students. And of course, the rest of the students listening will benefit from the questions and the answers that you’re giving. So I think until next time then. Thank you very much. Andrea: Bye-bye. See you soon. If you enjoyed this free IELTS Test Prepcast, please show us your support and appreciation by heading over to ieltstestprepcast.com and clicking the “subscribe on iTunes” button at the top of the page. This will shoot you over to iTunes, where you can leave a rating and review. 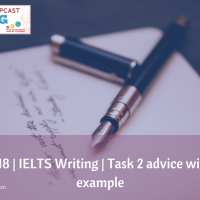 You’ve been listening to the IELTS Test Prepcast, which provides three free IELTS lessons for candidates aiming for IELTS band score 7, 8, or 9. Subscribe to this prepcast in iTunes, or download it from our website, www.ieltstestprepcast.com. If you enjoy this free IELTS Test Prepcast, please show us your support and appreciation by clicking here. This will shoot you over to iTunes, where you can leave a rating and review.